Restoring small to medium sized cavities. Restoring a chipped anterior (front) tooth. First, The Dentist will answer any questions you have and will apply anesthetic to the tooth requiring the filling. 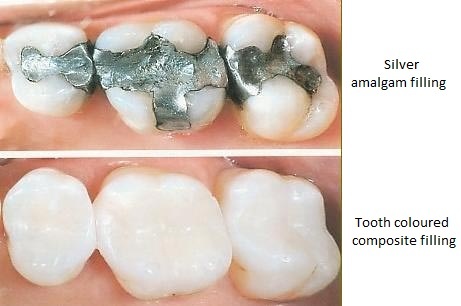 Then will thoroughly remove the decay that is present and prepare the tooth to successfully bond with either the composite material or amalgam. In addition, composites are "bonded" or attached with adhesive to the tooth, often allowing a more conservative repair. Composite fillings require that the tooth be kept clean and dry during the entire filling process. They are also subject to stain and discoloration over time. The life expectancy of a white filling can depend greatly on where it is in your mouth and how heavily your teeth come together when you bite.